Torquay weather and temp in Fahr. 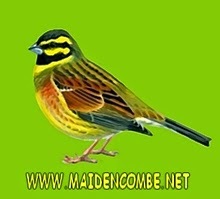 Maidencombe resident since 1960. 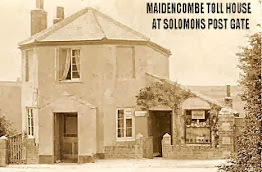 Local historian and author of the 'Coves of Maidencombe'. as seen above Maidencombe cove. Out and about last night and there was a short, sharp heavy shower out at Galmpton near Churston. Maidencombe, however, seems to have missed out and we may have to wait until later in the week for our share. 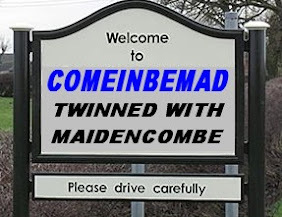 The twinning of Maidencombe with Comeinbemad reflects the light-hearted nature of this gentle blog. The articles posted are written by the author alone and have no connection with any official body or association. Eerily shrouded in mist, two of the lower chalets of Sladnor Park. BURNING OF THE BAMBOO MAN ABR. 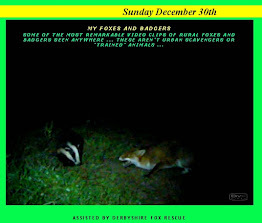 from Jim Blue on Vimeo. The old Toll House on the west side of the A379 Teignmouth Road, stands at the junction of Claddon Lane with the A379 about 50 yards from Ridge Road and the former position of the black and white Solomons Post sign (see side panel right). This early photo shows the open porch (lower left) - now blocked off and the blanked out toll-board recess (top right). Under the angled roof on the right, there is a small shop and working post office. The building probably dates from 1827 when the new road was built. 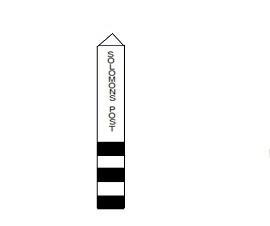 Originally named Solomon's Post Gate when there was a gate across the road for the toll collector to open upon payment. 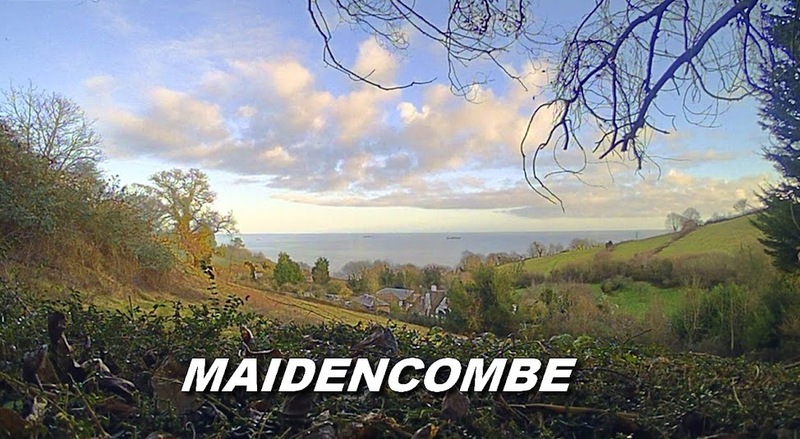 After scrutiny by a panel, this site has been added as a reputable source of information about Maidencombe. The first Timeline evening took place Wednesday evening March 20th at the Thatched Tavern. Local lad Ziggy Austin's brainchild, it was an endeavour to map out the history of Maidencombe on a ten metre paper scroll. The initiative was first mooted and widely supported on Ziggy's Maidencombe Residents Facebook page. Residents and non residents were asked if they could research local history on the area and bring along any material such as postcards or text to place on the scroll. The first evening was well attended and as can be seen in the photos on the left, a great deal was achieved. 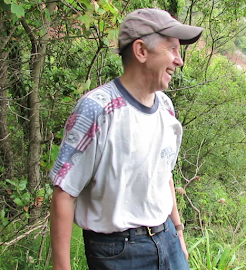 Longest residing villager, Alan Hunt attended to add his considerable knowledge and was supported by his 'young' student Jim Campbell with a mere 53 years of residence under his belt. The pub opened up the restaurant area for the occasion and were most generous in providing sandwiches for the studious throng. No known images of this iconic Maidencombe landmark exist. Post war and up to the late 1960's, sign posts were wooden posts painted black and white. This is a close reconstruction of the sign where buses would actually pull in to for passengers to alight or board. A video of one of my foxes being treated for Sarcoptic mange - taking the medication on the food by hand. She recovered completely and my thanks go out to the Derbyshire Fox Rescue who supplied the medication. Worth a look as Maidencombe's section of the SWCP is also very much under threat. CLICK HERE FOR Marine traffic in Lyme Bay and in view off Maidencombe - live feed. Excellent site for identifying all vessels. 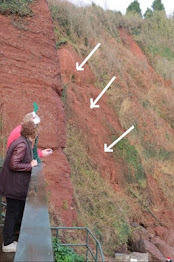 Photo taken from the beach cafe above Maidencombe cove and the arrows indicate the cause for concern. A minor land slip has already taken place and the Environment Agency had a look Christmas eve in case the cove had to be closed. After a catalogue of antisocial behaviour displayed by motorists illegally entering a private area, the police recommended that the entrance be made narrower. A sad indictment of society. Constructed between 1830-1833 by Mrs Groves who inhabited Sladnor Manor House at the time. 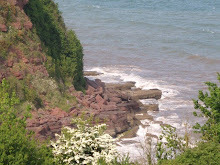 The hexagonal tower and accompanying arched outbuilding were built of Devon red sandstone. A projecting castellated cornice crowned the gothic apertures and single faux crossbow slit at ground level. A most interesting aspect of the folly is the purpose-built pony and trap winding carriage-way which Mrs Groves carved through the north western woods of the estate to facilitate her passage to and from the folly. The structure is now in poor condition and it is earnestly hoped that Richmond Villages, the new owners of Sladnor, will be able to make safe the folly to enable residents to enjoy in years to come. Circa 1850. Constructed of Devon red sandstone with unfortunately, as is the case with the Sladnor Folly, some cement patching. Sited at the eastern end of the garden, overlooking the sea. A single storey structure with faux castellated parapet. It has a one-window front incorporating a gabled porch on the front to left with a segmental headed and arched doorway. There is a matching arched window to the right. Reportedly, the structure had a flight of external steps for access to the flat roof with commanding views of Lyme Bay. The interior is clay-tiled laid.